Ozark Trail 2-In-1 Table Set Just $19.99! Down From $74! You are here: Home / Great Deals / Ozark Trail 2-In-1 Table Set Just $19.99! Down From $74! Right now you can get this Ozark Trail 2-In-1 Table Set for just $19.99 ($74) at Walmart! 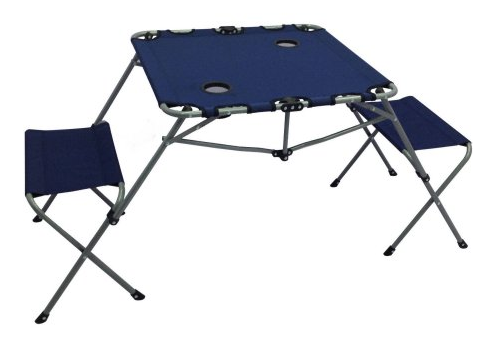 This two-in-one camping table set features two seats and two cup holders. Ozark Trail Outdoor Equipment makes camping equipment that will diligently accompany you on even your most rugged adventures. From tents to camping showers, outdoor appliances to outdoor seating, camp cooking to brewing coffee hundreds of miles away from the nearest coffee machine; Ozark Trail Outdoor Equipment has you covered whether you’re in the backyard or in the middle of the wilderness. Designed with durability in mind, Ozark Trail crafts camping gear that will not let you down in a serious situation. Ozark Trail crafts their products for the ultimate ease of use in what may not always be an easy environment. Yeah, got me one of those 2 in 1 table sets!!! Probably should have got one, or two more. Oh well, thanks Dian’s Deals!!! I’ll keep watching, you always have great deals.. Happy $th to you, and your family. Thanks for the kind words! You’re very welcome and Happy 4th to you and yours, too!